Nearly Half of U.S. Children Will Eat on Food Stamps. 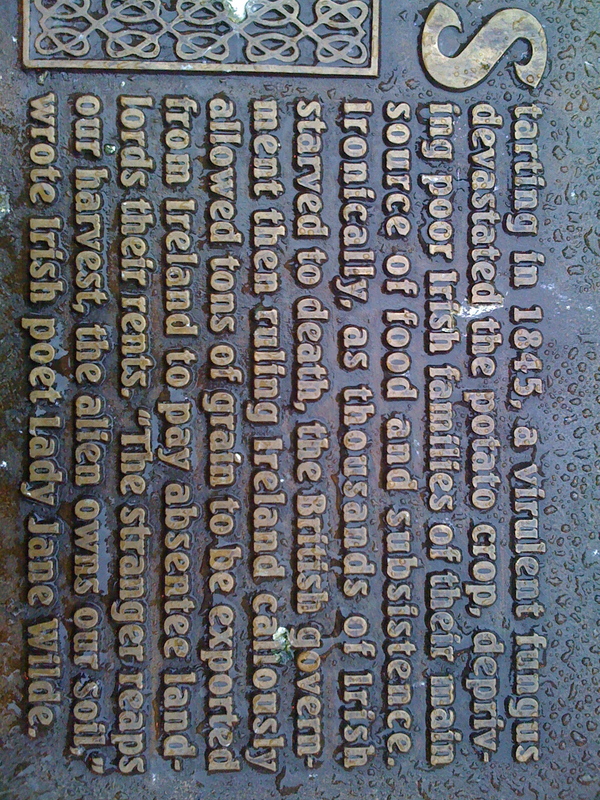 While walking the Freedom Trail in downtown Boston this week, Kerri and I stumbled across a memorial to Irish immigrants who struggled during the potato famine. Photo by Christopher. The other day, I asked Kerri if she thought it was too late to have our publisher change something in our upcoming book. I was prompted to ask because of a recent report released by the USDA which stated that 49 million Americans (1 in 7 households) are currently in need of some type of food assistance; a number that in August hovered around 36 million. In the second part of our book we talk in depth about SNAP (supplemental nutrition assistance program), formerly known as food stamps, and as it stands now, when our book is released we will have drastically understated the scope of the problems people are facing. Then yesterday, a shocking projection was revealed across the newswires: nearly half of all children in the United States will eat on food stamps during some part of their childhood. Rector’s comments seem to stem from the same place that many libertarian economic philosophers do, one of “every man for himself” and “pull yourself up by your bootstraps” rhetoric that does little to account for the contexts or the individual situations that people face. When your research is aimed from a certain philosophical gun, it’s pretty easy to hit the target you’re aiming for. The Heritage Foundation has such an arsenal, and uses it frequently on issues of social spending. Meanwhile, local food pantries and charities keep plugging away while the need for services climbs, and resources diminish. While the work of these groups is essential, it is not enough, and on its own will never come close to getting at the roots of these problems. That being said, we would like to ask you once again to do what you can to help others, either through donating to those in extreme poverty abroad, or to those facing food insecurity in your community (or both). Inspiration for the “Faces of Hunger” Contest. The latest video from the New York based group Improv Everywhere was released today and is called “Grocery Store Musical.” Enjoy. In addition, for those budding filmmakers out there, consider making your own short film about hunger for a cash prize. While it may be too close to the deadline for some of you, the “Faces of Hunger” video contest asks people 25 years old or younger to document hunger in his or her community through a short film (5-12 minutes) for the chance to win a prize of up to $5,000. Please share the opportunity with those you know, and if we can make a suggestion: if you win, give some of the money back to the community organization most effective in delivering food to those who need it. The deadline for the contest has been extended to October 30, so with a little over a week, there’s still time to shoot, edit, and submit. You can do so by visiting the Faces of Hunger Web site here.